2/55 Reagen Sulewski An astounding film on its own terms, but one that expands on and surpasses the original. 13/126 Kim Hollis Best comic book movie since Tim Burton's Batman. Deeply personal and emotionally resonant. 15/92 David Mumpower The choice of Doc Octopus as lead villain sounded crazy at first, but he proves to be the best comic book heel since The Joker. A sequel that was green-lighted before its predecessor was even released, Spider-Man 2 is primed to continue what will most likely be one of the biggest film franchises in movie history. Spider-Man is poised to become the first ever movie to keep a Star Wars film from finishing first overall for the year that it is released, and its sequel seems likely to repeat the effort in 2004. Another trend that this film will continue is Marvel Comics' stranglehold on the extremely lucrative first-week-of-May release period. In 2004, the summer will once again be ushered in by a costumed superhero. Tentatively scheduled to begin filming in January of 2003, the movie will bring back most of its principal actors, including Tobey Maguire, Kirsten Dunst and James Franco. The three will reprise their roles as Peter Parker/Spider-Man, Mary Jane Watson and Harry Osborn, respectively. Also returning to the franchise will be the first film's director and, along with Maguire, the person most being held responsible for the tremendous success of Spider-Man, Sam Raimi. Raimi will bring all the enthusiasm of a childhood love for Spider-Man as well as the experience of making the original to a project that will come with high expectations. And Raimi has learned much from his endeavor. His first decision for the sequel was to not add any new characters, mainly villains, whose face you could not see, a sentiment learned by anyone who has seen Spider-Man. 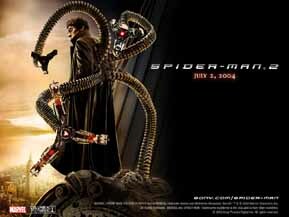 From what we know at this early time, the main villain in the sequel will be Doctor Octopus, a brilliant scientist who has mechanical arms fused to his spine in a laboratory accident. Another rumored villain who will not be making an appearance is The Lizard, although the character's alter-ego, Dr. Curt Connors, was mentioned in the original film and will be present here in the form of Dylan Baker. Similarly, The Black Cat won't be present but her alter ego will be played by Brooke Adams. The film will likely deal with Peter/Spider-Man having to handle college, a new love and ever-growing responsibility, and while it will be difficult for the sequel to recapture the humanity of the first film, it certainly is not impossible. Mix the heart of the first film with a promise of more high-flying action scenes and the franchise looks like it will continue to dominate the box office. With over $400 million already in the bag and on its way to over $800 million worldwide, Spider-Man is one of the biggest movies in history and at this point, it is impossible to know how its sequel will fare. Perhaps it will be easier to make a guess after we have seen how movies like Harry Potter and the Chamber of Secrets, Lord of the Rings: The Two Towers and The Matrix Reloaded will do. Unfortunately, the first Spider-Man has some, but not enough, commonalities with the predecessors of those films. Spider-Man had the gigantic opening that the first Harry Potter film did but had considerably better staying power. Spider-Man also had the tremendous response that both Fellowship of the Ring and The Matrix had, but neither of those films enjoyed the tremendous out-of-the-gate head-start that Spider-Man did. Perhaps it is more accurate it to compare it to Attack of the Clones, as Spider-Man's start and finish at the box office can be comparable to The Phantom Menace, but Clones' box-office shortcomings are just as puzzling as Menace's success. Incidentally, as has been pointed out on the site previously, Clones' numbers fall within the Star Wars pattern established by the original trilogy and its re-release into theatres. The hype has begun in earnest. There is no doubt that Spider-Man 2 is the favorite to finish 2004 at the top of the box office charts, and with the teaser trailer being attached to Return of the King this past December, fans have begun salivating for the next chapter in the life of the Peter Parker. What we have seen so far is exactly what we have expected, indeed, wanted, and that is more of the same. The look of the film is consistent with the Spider-Man and there seems to be an abundance of web-swinging action. Doctor Octopus looks menacing and believable; gone is the cheesy Green Goblin B-grade Halloween costume. Mary Jane is back and she’s putting Peter on the spot again. Harry Osbourne follows up on his promise of making Spider-Man pay for supposedly killing his father. Everything you would hope to see is in the admittedly low-key trailer. With the apparent train-wreck that is Catwoman surrendering its IMAX release spot, Sony has stepped in and agreed with IMAX to release Spider-Man 2 in their DMR re-mastering format. Spidey will swing into IMAX theaters across the country on July 23, 2004.